The term 'guard' refers to the position in which the hands are held when fighting. There are many differing opinions on which is the 'correct' or 'best' guard position. So where should we hold our hands in order to effectively fight and defend ourselves? Should the hands be held high, as in boxing? Or should they be held lower, as in modern karate? Why all the variations? In this article I'd like to explore these questions, and in particular look at the use and evolution of the guard in karate. In most modern karate dojos, the hands are held fairly low. One hand is typically positioned across the chest, with the lead hand being extended away from the body level with the chin. This common guard position is often criticised for its failure to offer the head sufficient protection. It is argued that the 'karate guard' position is not suitable for use in real situations and the 'boxing-style' guard position is often cited as a more practical alternative. In boxing the hands are held higher and the elbows are held close to the body to protect the ribs. The head is also tilted forwards and the shoulders raised to add yet further protection to the jaw. It would seem that the boxing-style guard does indeed afford the vulnerable areas of the body better protection, so why do karateka hold their hands the way they do? 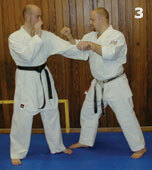 The best way to answer this question is to look at the evolution of both the karate and boxing guard. If you've ever seen any photographs or illustrations of the bare-knuckle boxers of the past, you'll have immediately noticed that their arms are held much lower than the boxing guard of today. It can be tempting to assume that the guard of the bare-knuckle boxers was simply a 'mistake' that has been corrected by the passing of time. Not so! The hands were deliberately held low because that was the most effective position to hold the hands at the time. Why? Because the 'rules' made it that way. In the boxing of the past, no gloves were worn and it was perfectly acceptable to grapple and throw (see my 'Throws for Strikers' book). Another important rule difference was that the rounds were not timed, as they are today, but were deemed to have ended when one of the combatants hit the floor. Because of this rule, boxers generally avoided getting too close and opening themselves up to throws. The emphasis was therefore firmly on straight punches thrown from a distance. Also, because the combatants didn't wear gloves, the modern practice of covering up and 'hiding' was far less effective. The favoured defensive option was to parry the punches, and to make parries work you need the space and time to react. The boxers fought further apart than they do today and the front hand was held in an extended position in order to deflect punches before they got too close to the head. The increased distance and the need to frequently use parries are the reasons why the old-style boxing guard had the hands lower and further out. As time passed, the rules of boxing changed. Because throws are no longer a part of boxing, and because the gloves can provide good protection, boxers tend to fight much closer and make much greater use of close-range punches like hooks and uppercuts. We can now see that the guard evolved as the rules changed. We can also see that the 'most effective' guard depends upon the prevailing rules and environment. It is what works best in any particular environment that determines the most effective guard position. There is therefore no such thing as a generic 'best guard', just the best guard for a given scenario. Returning to the karate guard; why are the hands held as they are? Again, the answer is because competitive rules make that the most effective position. In most karate sparring, the combatants fight at an extended distance (meaning there is time to react and block) and the vast majority of punches used are straight mid- to long-range punches (which is why the modern karate guard has a lot in common with the bare-knuckle boxing guard). Another factor that makes the low guard effective for karateka vs. karateka sparring is that a significant proportion of punches are aimed at the body (same number of points and a larger target). Obviously, not all karateka are actively involved in competition, so is there a better guard position for use outside both the dojo and the competition arena? In fact, what about the days before competition? What was the 'original' karate guard? Karate is a civil tradition. It was originally formulated and developed not by warriors or soldiers for use on the battlefield, nor was it developed by athletes for use in sport. Karate was formulated by the unarmed civilians of Okinawa for use in self-defence. If we believe that karate's founders knew what they were doing, it stands to reason that the guard used in 'old-school' karate, or something along those lines, should be the guard used in self-defence situations. So what was the 'original' guard position used before the advent of competition and karate's shift away from self-defence towards the defeat of a fellow karateka? The perhaps surprising fact is that there was no original karate guard! Guards were not emphasised, as is evidenced by the fact that there are no formal guard positions shown in the traditional katas. So why weren't guards emphasised? It should be understood that guards are normally used when two people are testing one another at a distance. The combatants will maintain their guard when testing and looking for openings, before putting their hands to work when the distance closes. It is for this reason that guards are commonly used when two skilled combatants are involved in a fight. From a self-defence perspective, the last thing we want is 'a fight'. Our aim is to avoid the situation all together, and failing that we hit first (a tactic emphasised and endorsed in the writings of great masters such as Funakoshi, Mabuni and Motobu) and then flee. If fleeing is not felt to be an immediate option, we should maintain dominance until we can flee. We are not fighting, we are defending ourselves. In a self-defence situation, there is no gap to close as we will already be within striking distance, and as a result the arms should be actively working. There is rarely the need or the opportunity to make use of a formal guard in a self-defence situation. Assuming running isn't an immediate option, the non-striking hand would be better employed by actively controlling the opponent's limbs as opposed to being pulled into a guard. It is this methodology that is emphasised by the katas. Through the active control of the limbs, we limit the opponent's striking opportunities, we can open the opponent up for strikes, and we are better positioned to maintain our dominance over the opponent. Rather than holding our arms in a guard, the arms should either be striking or controlling the opponent. Certainly if we are in a fight (i.e. fighting at a distance with the back and forth motion common to competitive marital arts) then having a guard is very useful. Exactly what type of guard depends upon the situation. If fighting with boxing gloves on, it would be a good idea to hold your hands high with your elbows in. If fighting a fellow karateka in a competitive way, you would be wise to hold your hands lower and further out. In the unlikely event that you end up at a distance in a self-defence situation, you should run! If we fail to effectively manage a self-defence situation, escaping is not an option, and it evolves into a 'fight', I would advise having your hands high, more like the modern boxing guard as opposed the competitive karate guard. I feel the low karate guard, although perfect for much of modern karate sparring, is not really suitable for much else. I prefer to have my hands higher, not so much for protection - although that is obviously part if it - but mainly so the hands are in a good position to strike and work. However, it should be understood that guards are for use during a fight (sporting or otherwise), not self-defence. Being pre-emptive should not involve the use of a guard (it will give the game away!). Additionally, because as the overwhelming majority of self-defence situations start close up, and stay there until their conclusion, there is no gap to close and no back and forth movement. At close-range, the limbs should be actively working rather than being held in a guard. It is for that reason that guards were not emphasised by the Okinawan karateka when formulating their art. The katas are a record of the forerunner to modern karate, and when looking at the katas you'll notice that no type of formal guard is ever used. Indeed, karateka often seem to be ridiculously open on many kata techniques. 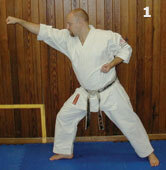 As an example, take a look at the common karate lead hand punch shown in Figure One. Notice how there is no guard at all and the back hand is held very low. This practise is frequently criticised, and if the karateka is putting the hand on the hip for no good reason, then this criticism is not without foundation. One of the problems that modern karate faces is that the katas are not studied in sufficient depth and hence misunderstandings arise. The back hand is not pulled to the hip for the sake of it. The back hand is there to control the opponent's arm, limit their striking possibilities, and open them up for the punch (as is explained in Funakoshi's early writings). There are obviously many different ways to gain control of the opponent's limbs (see volume one of my Applied Karate DVDseries - released spring 2005). However, for the purposes of this article we'll look at a simple drill I use to introduce students to the basic idea of limb control, which also shows one reason (there are many others) why the hand is pulled towards the hip on many kata movements. Incidentally, although the katas don't contain formal guards, they do contain a vast amount of close-range limb control techniques and drills. Stand reasonably close to your partner who will have their hands raised, either in a pleading position, a quasi-guard, a 'fence' etc. It doesn't really matter so long as your partner's lead hand is above their waist. I'll emphasise that this is a simple drill to introduce basic limb control. In application we should have already struck the opponent and therefore they are unlikely to be in such a 'balanced' or formal position. However, the concept remains essentially the same. 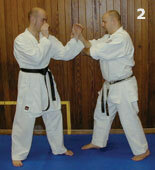 Your right hand locates the opponent's arm and starts to push it down as the left one slips underneath (Figure 2). In the drill your partner is passive; however, in the rough and tumble of a live situation this tactile awareness and location of limbs is very important. The right arm gains momentary control over the opponent's arm and therefore allows the left arm to establish better control (Figure 3). Without the right hand first locating and momentarily controlling the opponent's arm, it would be much more difficult for the left hand to gain control in a live situation. It's very important that the switch between the arms happens very quickly and constant contact is maintained. Pull the opponent's arm in order to open them up for the lead hand strike (Figure 4). This is a fundamental limb control method and one of the first taught. Notice how the hand position resembles the position shown in Figure One (hand is being pulled towards my hip). Because I have active control over the opponent's arm, there is less chance of being hit than if I had my left hand beside my jaw as a guard. The control over the opponent's arm also means that my punch has a much greater chance of landing and I have a greater awareness of my opponent's position and intentions. To follow the lead hand punch, we should move the striking hand to the opponent's elbow, in order to maintain control over the limb, and deliver a rear hand punch (Figure 5). 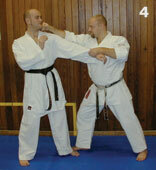 With a little practice it is as quick and easy the throw the two punches shown using limb control as it is without. Again, you'll notice how the 'controlling hand' affords greater protection and gives us more of an advantage than if it were arbitrarily pulled back into a formal guard. The drill shown is a basic example of limb control and there is obviously much more to the subject. However, the pushing down on the elbow to control the opponent's arms at close-range is particularly common throughout the katas. 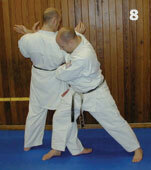 As an example, we can look at the use of the 'spear-hand' from Heian Nidan / Kushanku / Kanku-Dai (Figure 6). In addition to using limb control to open the opponent up for furthers strikes; we can also use limb control at close-range to set the opponent up for takedowns. Your arms have made contact with the opponent's (Figure 7). The clashing of arms gives you a tactile awareness of the position of the opponent's arm. The left hand then slaps the opponent's elbow downward. Keep control of your opponent's elbow as you shift forwards. Extend your right arm so that the inside of your arm slams across the opponent's chest. This will take the opponent over your leg and onto the floor (Figure 8). We can see that the arm across the chest on the 'spear-hand' is yet another example of limb control. Ironically, the arm across the chest is frequently explained as 'guard' to cover the solar-plexus. Remember that the vast majority of kata techniques are for use at close-range and therefore limb-control is emphasised over formal 'guards'. When at close-range, it is better to make use of the arms in an active and positive way whenever possible. We should follow up our initial strike not by moving our hands into a guard, but by continuing to strike and actively controlling the limbs of the opponent as this makes the opponent easier to hit and prevents them from striking us, making use of a weapon etc. In order to get things into perspective here, it's worth saying that the key thing is to deliver strong strikes in order to facilitate escape. In the first instance we are looking to strike, not gain control of the limbs. Limb-control is something we use to facilitate strikes at close-range; it is most certainly not a mandatory precursor to the delivery of strikes! If we haven't got control of the limb, the hand should be in a position ready to work (not pulled to the hip!). Limb control should be used in an instinctive way to maintain and create advantages. Through practise, limb-control should become an automatic habit (and a good habit at that). To conclude, guards vary depending upon what arm position is most advantageous in any given situation, environment, or set of rules. The guard most commonly attributed to karate is the most efficient for long- to mid-range karateka vs. karateka sparring; it is not of much use outside that environment. As regards self-defence, the use of a guard is rarely needed if we endeavour to avoid a 'fight' by hitting first and then either running or continuing to dominate. When at close-range, limb control is generally a more effective alternative to a formal guard. If for whatever reason, it's all gone wrong and the situation degenerates into a 'fight', then the use of a formal guard may be required. However, the intention is to never find ourselves in the situation where a guard is needed.